I’ve been crazy for quinoa lately; I just can’t seem to get enough of it. I’ve been adding it to soups and stews and basically any other dish that could use a grain. It’s fast and nutritious and it just plain tastes good. One night last week, I needed something healthy that I could get on the table fast, so I decided to treat quinoa like the rice in fried rice. Since quinoa cooks so much faster than brown rice, I was able to put this together in about half an hour and still use a whole grain. I’m not sure how much it tastes like fried rice, but whatever it tastes like, it’s terrific. D and I ate ours with a little (or a lot) Sriracha chili sauce, while E gobbled hers up “as-is.” Besides being quick and tasty, this was an excellent way to use up some of the vegetables in my fridge and a delicious way to get my family to eat their greens. Though I really recommend this mushroom-bok choy-carrot combination, use whatever vegetables you have on-hand. Greens like bok choy really shrink when cooked, so if you substitute another vegetable, do it by weight rather than volume. Put the quinoa, water, salt, and 1 clove chopped garlic into a medium-sized pot. Bring to a boil, reduce heat, cover, and simmer until water is absorbed and quinoa is tender, about 15-20 minutes. While the quinoa is cooking, prepare the vegetables. Wash each stalk of bok choy then cut it in two about where the leaves begin. Set the bottom white stalk aside and save for another use. Chop the remaining stalk and greens into bite-sized pieces. Lightly spray a large, deep skillet or wok with cooking spray (if you like) and heat it. Assemble the vegetables nearby, along with the vegetable broth and a tablespoon. When the skillet is hot, add the ginger root, garlic, and carrots and stir-fry for about 1 minute. Add about 1 tablespoon of the broth and continue to cook and stir for another 2 minutes, adding another splash of broth if the garlic starts to stick or dry out. Add the mushrooms and another tablespoon of broth, and cook another 2 minutes. Add the bok choy and 2 tablespoons of broth, stir, and cover. Cook until the bok choy is tender but still bright green, just a few minutes. Crumble the tofu into the vegetable mixture. Mix the soy sauce and vinegar with the remaining broth and pour it over the tofu. Stir and cook for 1 or 2 minutes, just enough to heat the tofu. Fluff the cooked quinoa and add it to the vegetables. Mix well, and cook until heated through. Serve with additional soy sauce, hot mustard, or chili sauce at the table. Most quinoa bought from bulk bins needs to be rinsed well to remove the soapy outer coating. If you’re not sure whether or not your quinoa needs to be rinsed, rinse it anyway. Pour it into a fine mesh strainer and stir it as you run water through it for at least 2 minutes. Per serving: 213 Calories (kcal); 4g Total Fat; (15% calories from fat); 10g Protein; 37g Carbohydrate; 0mg Cholesterol; 515mg Sodium; 5g Fiber. 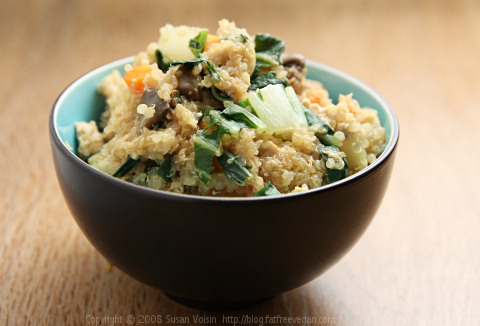 Or just use quinoa anywhere couscous, millet, or bulgur wheat is used. I am a total quinoa fanatic, so I felt I had to jump all over a small error in your post. Quinoa, while often used as a grain, and referred to as a grain, it is in fact a seed. A small detail, I know, but I felt obliged to point this out. Botanically speaking, all grains are seeds! All nuts are also seeds! This is the first recipe I have tried from your site and it was awesome. I'll definitely be making others from your site. Quinoa is a particular favorite of mine because it's Kosher for Passover, and there aren't that many carbohydrates that are. 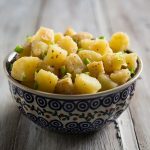 I just found this recipe and made it for dinner- it was wonderful. I did use some sesame oil for cooking and increased the tofu to a whole package- I'll be making this again! Thanks, Susan! I made this last night and it was soooo yummy! I actually thought I had some quinoa but realized I was out so I used cous cous instead. 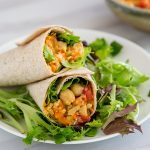 It still tasted amazing and this will definitely be a “go-to” meal for us since it was so easy to make yet filled with good veggies. This looks great! Ive been looking for more ways to incorporate more quinoa into my diet and this looks awesome. I may add a little of the baked teriyaki tofu to add a little more protein to make it a complete meal. 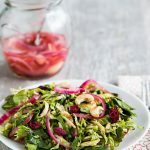 As you know, this is another old favorite of mine, and I make it a lot in the spring and summer when fresh greens in my garden are abundant. My favorite green to make it with is mustard greens, the red giant kind that volunteer all over the place in my garden. They and the arugula are the first ones. This year I got curious and wondered if I could sub adzuki beans for the tofu. This started one day when I only had a tiny bit of tofu left and some adzuki beans on hand. I’ve made it since with only the beans and it works great that way too. With the beans, I add a little spoonful of umeboshi plum paste to the remaining broth-tanari-rice vinegar mixture. It goes pretty well. This is a wonderful recipe that is very forgiving in temrs of experimentation. And it’s great comfort food! Just thought you’d like to know I’m still enjoying this one, too. Just tried this last night, after doing a search for “quinoa” on your site. 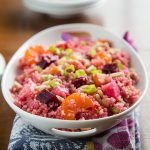 I like the protein count of quinoa, it gives a break from having brown rice, and cooks easily in the rice cooker, and it is colorful if you are able to find the red or black quinoa at Trader Joe’s (TJ’s) or Whole Foods. I could not find bok choy at TJ’s so I substituted broccoli, red pepper, and frozen green peas. I borrowed the idea of using baked teriyaki flavored tofu (found at TJ’s) from one of your readers, and I cubed the baked tofu instead of crumbling it. The ginger and garlic cooking together with the carrots smelled great and I believe the ginger really made the dish, along with the little bit of soy sauce and rice vinegar. This colorful dish and satisfying had an authentic Chinese fried rice taste. Your suggestions to serve with soy sauce, chili sauce and/or hot mustard was good, most preferred the chili sauce, and I loved the hot mustard. Yum yum! Your blog is the best, I find your recipes work consistently and we appreciate the low fat emphasis. I make one of your recipes 2-3 days a week at least! I just made this last night and as usual with your recipes, it was delicious! The only thing I changed was doubling it so there would be leftovers, added a few chopped sundried tomatoes to the quinoa and omitted the salt. It was fantastic! Even my daughters, who until last night would only willingly eat tofu when it was baked, said they loved it and asked to have seconds! Thank you so much for making it easier to feed my family healthier meals that they actually like to eat! I made this tonight and it was really good. Especially with hot sauce. My son 14 year old son who is transitioning into vegan eating kicking and screaming liked it, and that is saying a lot. This is an awesome web site and I love all of the things I’ve cooked from here. Great recipe. I actually didn’t have enough quinoa, and made the recipe with barley instead. It turned out great! Every Monday, I make something “new” for the family. If they love it, it goes in to rotation. If not then we just discard it. Well, this was the “new” recipe tonight and my family loved it! I was in a hurry so I made a couple of changes. I cooked my quinoa, mushrooms, and onions in the rice cooker with vegetable broth instead of water. Stir fried (in broth) the carrots until tender, tossed in the bok choy, and cooked a little longer, then threw in the tofu which I had cooked to a firm texture in the oven, and then added the finished quinoa and the rest of the ingredients. So amazing! Had plenty left over for tomorrow or the next day. Another winner Susan! Thank you so much! I can’t wait to try this…it looks wonderful! Question about adding water when sautéing garlic in water… I find that when I add water when the garlic starts to stick, the garlic and water kind of start to “pop” and splatter all over the pan and stovetop and leaves white spots (from the garlic) on the pan. Have you ever had this problem? If you (or anyone) have ever had this happen, is there a way to prevent this from happening? Anyone know why this always happens to me? Any tips for “sautéing” without oil without burning the garlic (or shallots or onion or other aromatics)? Can You make this ahead of time or will it dry out ? Yes, just keep it covered and it should be fine.